I used to leave the office at the end of the day and wonder, “where did all the time go?” I decided in this journey of getting myself organized I would start writing things down in a spiral notebook and then review my notes at the end of the day during quiet time with a glass of wine. Managing your voicemail and email or better yet getting control over it will lighten your load and allow you to get to your goal list. Would you like to show the boss or your team mates how you overcame the time-eating-dragon with one or two simple ideas? Well, let’s go and get this handled once and for all. 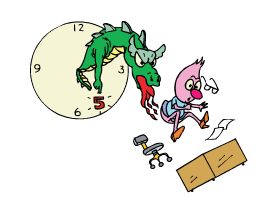 Enter the time killing, goal eating dragon, aka, interruptions in person, by phone, stopping to read and answer email, facebook, twitter etc. Everyone it seems wants a part of you and your total attention. Have you ever kept a count of how many times you were interrupted? Did you note the time of the day you had to lay down the project you were working on and the time you got back to that particular project? It is a known fact that once you are interrupted it can take you up to 15 to 20 minutes to get back to the point of where you left off. During that time did your idea for a new ad campaign or the best statement to include in your sales presentation disappear into thin air? This is not uncommon and that is why interruptions cost your business and boss and you money. So what’s the best way? Just as we did last week you have to bunch your phone messages, emails or ask if the visit from the person who is standing at your desk requires immediate attention. For your phone calls, you would program into the voice mail system a message telling when you are available to receive calls and return voicemail. IF you are on a deadline with a special customer let them know they can reach you via a special direct phone number. 1. Batch your phone messages: return immediately or can be handled on free time. 2. Check email only in the time designated as your phone message time. 3. Don’t forget to return your personal calls and emails on your time and not company time as it is very costly to everyone. As I continue to get my life in order, I find I have more time for friends and self. I use to put everything on a pile and ignore the pile as it got bigger and bigger. Now I just get it done and then move onto peace and happiness and less stress. Please let me know if there are other organizing tips we should be reviewing! Join our Face book to stay informed with all the ways Print & Copy Factory can assist in ‘making a difference’ in your life! You can reach PCF at the following websites:www.printcopyfactory.com; www.pcfwebsolutions.com andwww.blog.pcfwebsolutions.com.